It's now launching on Steam Early Access six days later than announced. Pirate MMO Atlas has been delayed until December 19. It was meant to start sailing the high seas of Early Access this week, on December 13, but it’s an enormous game, judging by Steven’s hands-on preview of Atlas, and the developer has decided to spend a bit more time getting it ready. Atlas will let pirate captains rule over their own islands, participate in big multiplayer ship battles and explore hundreds of islands in a single shared server. 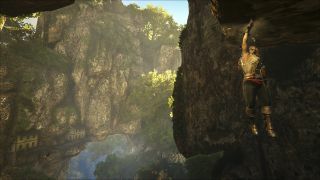 And judging by the new screenshot above released by the developer today, you’ll be doing a spot of climbing as well as sailing. “Deep within an uncharted jungle, a lone adventurer hang-climbs across a vast chasm on her way to lost treasure, while a wild bear and exotic bird roam far below,” reads the description. It looks like an awfully long way down. Atlas will launch on Early Access next Wednesday.